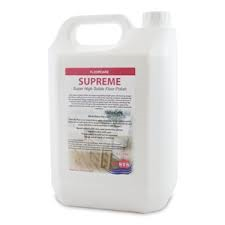 An extra high 24% solids, dry-bright metallised emulsion polish that is particularly suitable for use on high wear areas where it will produce a long lasting durable shine with an excellent response to spray buffing. At this solids level all the properties of the polymer will be obtained in the least number of coats and its prolonged life will extend the period between expensive stripping and re-polishing operations. Ensure floor has been properly swept and cleaned before application, making sure that any oil, grease and old polish has been removed. Rinse well with water and allow to dry thoroughly. Mop or apply a thin film of product onto floor. Allow 30 minutes to dry. Apply a second thin coat and allow to dry.